No one was expecting a lot from the Russian Grand Prix, so I'm happy to report that it was perhaps the best racing in Sochi that we've seen. Make of that what you will though, there was still a lot to be desired about the smooth surface and a lack of overtaking. Still, we saw a few unexpected retirements, heard some fascinating radio messages, and experienced a first time race winner! 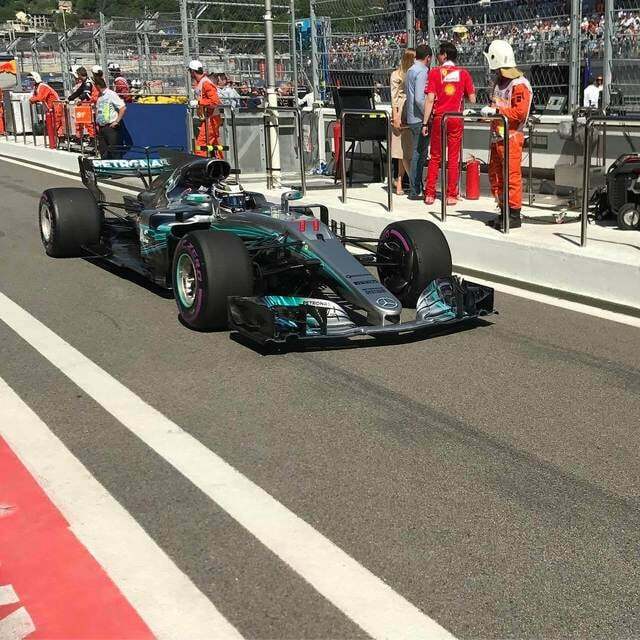 If you missed any of the action or need to catch up with what happened during the Russian Grand Prix, then read on for lap by lap coverage of the fourth round of the season. Valtteri Bottas wins his first ever Grand Prix after close fight to the finish. Vettel drops behind Bottas on first lap and hunts him to the chequered flag. Hamilton struggles in a distant fourth place, finishing behind Räikkönen. Alonso retired on the formation lap after an ERS problem on the McLaren. Ricciardo retired with brake failure whilst Grosjean and Palmer collided on the first lap. Hi F1 friends, it's time for another race! The fourth round of the season, it's Russia! There's drama already, as Max Verstappen's Red Bull has developed a water leak, so the mechanics are scrabbling to patch it up in time for the pit lane opening. The main concern going into this race is that tyre strategy isn't going to play a big part in proceedings. The track is very light on tyres, so one-stopping is expected. Qualifying was a tense affair, with Ferrari just edging out Mercedes to secure an all-Scuderia front row. Vettel ahead of Räikkönen, with Bottas ahead of Hamilton. Verstappen's car looks to be all patched up, Max is in the car and it looks a lot calmer in the garage now. Romain Grosjean finished last in qualifying yesterday, but he's not last on the grid. Stoffel Vandoorne has taken a hefty 15 place engine related penalty, so he'll be last. Carlos Sainz has also taken his three place grid drop that was given after the collision with Stroll in Bahrain. He starts 14th. Fernando Alonso got through to the second session of qualifying yesterday, but couldn't do any better than 15th. He still sounded pretty frustrated by the whole situation. Both Force India drivers got into the top ten, which was a great achievement for the team who are currently sitting fourth in the championship. Pérez has a 3-0 lead on race day, though. Beautiful blue skies above the Sochi circuit, the grid looks clean and tidy, but very busy. Paul Hembery, on the grid: "[The drivers] seem to be happier, but it’s a competitive world. You’ve probably heard Lewis struggling a little bit yesterday, they weren’t quite getting the package working perfectly, but overall, they seem to be happier. One-stop, probably getting round to 20-25 laps. The safety car might change that but relatively straight forward." Daniel Ricciardo, on the grid: "We know that the guy’s in front of us are very quick, but you still approach it with an attacking mindset. Things happen in races, nothing’s impossible. Sure I’ll be looking ahead but once the race settles down it might stabilise a bit." Stoffel Vandoorne, making his way to the front of the grid for the national anthem, from his position right at the back: "We’ve got nothing to lose, it’s all about the learning. The only way is up for us." Tweet from @redbullracing: Max on the grid and ready to go after some late but great work from the Team! Let's do this! The drivers have stood to attention at the front of the grid, for the national anthem sung by a choir in very patterned dresses. Tweet from @McLarenF1: Air temperature, 24 degrees. Race anticipation, even hotter. Less than 10 mins until lights out. Tweet from @C4F1: Karun: "Turn 2 is where it gets critical. Watch out for Bottas & Hamilton having a lunge, we should see a reasonable amount of overtaking." Almost all the drivers are starting on the purple ultrasofts. Only three have opted for the soft red sidewalls - Pascal Wehrlein, Marcus Ericsson, and Stoffel Vandoorne, all towards the rear of the field. Lance Stroll is starting from 11th today, the Williams driver has yet to finish a race this season so will be looking to see the chequered flag today. Fernando Alonso also hasn't technically seen the race end flag waving, but I should expect he isn't bothered one way or the other. Tweet from @pirellisport: With just one stop expected, the start will be even more crucial. Note that positions 2,4, and 6 are on the ‘dirty’ side of the grid. The formation lap gets underway with Sebastian Vettel leading the field down towards the first corner. The cars look lovely, all those colours glinting in the sunshine. Radio between Alonso and the pit wall suggests he has a low state of charge. Already a problem and the race hasn't started yet. And there he is, Alonso has pulled up at the entrance to the pit lane, climbing out of the car on the formation lap. Double yellow flags are waving as the marshals come running in to recover the McLaren. Off they go again, Vettel leading the field away. Meanwhile, Alonso is striding back to the pit lane, barely a look back at the car he has left behind. Helmet on, and who can blame him? Right, we're back on the grid again with Vettel pulling to a halt in his first position grid slot. Really poor start from Räikkönen, Bottas immediately jumped into second and then steamed past Vettel for first. Hamilton tried to make the move on Kimi but couldn't do it and remains fourth. Stroll has spun around but gets it going again and continues on towards the back of the field. Palmer and Grosjean are both out, the two cars in pieces and in the barrier. Turn 2 incidents under investigation. Team radio from Romain Grosjean: "So basically Palmer just turned into me." Vandoorne and Ericsson have come into the pit lane, taking the opportunity to ditch their supersoft tyres and bolt on the more favourable ultrasofts. That was the gamble we thought they would be taking, starting on the harder tyre. If they can get to the end of the race from here, that'll gain them some places. Interesting, Wehrlein still has the supersofts on, and hasn't stopped yet. Replays show Stroll's spin looked to be without contact, he said "I got pushed onto the kerbs and spun." Not damage though, except he's running 15th now. Plenty of weaving on the home straight as the safety car leads the field round for another lap. Replays of the very start show Hamilton had the edge on Kimi but was early on the brakes into the second corner and that let the Ferrari to retain the advantage. Turn 7 incident involving Stroll and Hülkenberg under investigation - causing a collision. Off they go and Bottas has swept ahead, he's not waiting around to be troubled by the Ferraris behind him. Wehrlein has changed his tyres at some point over the last few laps. The entire field are on ultrasofts now. Team radio from Daniel Ricciardo: "My right rear brake's on fire." There's a lot of smoke coming from the back of that Red Bull. He's slowing down and keeping off the racing line, but he should be able to get back to the pit lane. The Red Bull mechanics are in the pit lane waiting for the incoming Ricciardo, but Daniel doesn't seem confident he'll get going again. The extinguisher is used to cool the situation on the brakes, and it's race over for Daniel Ricciardo. Turn 2 incident involving Romain Grosjean and Jolyon Palmer will be investigated after the race - causing a collision. Turn 7 incident involving L Stroll and N Hülkenberg - no further action warranted. Bottas is really putting the hammer down, setting fastest lap after fastest lap at this early stage. He's got a 2.5 second lead already. Team radio to Max Verstappen: "Can you push your brake balance as far forward as you can take it at this stage?" They are really worried about the brakes over at Red Bull. 5 second time penalty for K Magnussen and S Vandoorne - track limits at turn 2. Hamilton is also on the radio complaining about the high temperatures on his car. Cooling a significant issue so far this afternoon. It will be interesting to see when the front runners decide to come in for their pit stops. Also keep an eye on Vandoorne and the Saubers, as they have taken their stops effectively for free under the safety car. Tweet from @SomeBoyTom: A lot of love for @ValtteriBottas in @WilliamsRacing garage at the start of Russian GP. cheering his move on the Ferrari's to take the lead! Team radio from Kevin Magnussen: "Did you talk to Charlie? It cannot be right, it cannot be right." Jolyon Palmer, firmly blaming the Haas for his retirement: "I turned into the corner, I had a Sauber on one side and Grosjean stuck in the nose on the other side. I basically got hit by him. There wasn’t a gap there for him. I had a car on the other side, I was sandwiched between two cars. He went over the kerb and basically hit me. I’m looking forward to going home, and re-setting for Barcelona." Team radio to Lewis Hamilton: "We are borderline on temps. Just do what you can do, this is good pace." Also sitting in the points at the moment, both Force India drivers who have moved up two places each, as well as Hülkenberg and Magnussen. Romain Grosjean has a different opinion on that first lap incident: "I haven’t seen the footage, to be fair. On the first point of view it’s Palmers fault… maybe there was a car on the inside… I was on the orange kerb, had a really good start. We just got ruined at the first corner." Carlos Sainz has been on the radio complaining of some rear brake issues. Bottas doing a fine job out in front, another fastest lap for the current race leader. Behind in fourth, Hamilton is on the radio quite a lot complaining about the state of his car. Field spread becoming an issue with all drivers at least a second apart from each other. The biggest gap is between Hamilton in 4th and Verstappen in 5th, with 14 seconds between them. Vettel complains he has blisters on his front left tyre. He's just about in the pit window. Will he come in first of the front runners? We're definitely starting to see wear on the tyres now. Hamilton had a lock-up that showed a significantly discoloured stripe on his front right. Pascal Wehrlein has come in to the pit lane for the second time this afternoon. A fresh set of ultrasofts are going on that Sauber. Felipe Massa is the first of the front runners to come in to the pit lane, from sixth position he dives in for some fresh rubber. Magnussen and Kvyat follow in to the pit lane for their own first stops of the day. Ericsson also comes in, that's Sauber putting both cars on a two-stop strategy. Vettel sets the fastest lap of the race so far - 1:38.197. Fernando Alonso: "Definitely worse than last year, we cannot even participate. It’s something that is not going right. Nothing I can do, probably. I come here, I drive as fast as I can, I try to help the team as much as I can. It’s frustrating at times and hopefully we can improve soon." Hamilton asks if anyone in front has pitted yet. They haven't. Felipe Massa is the first of those that have stopped, and he's currently running in tenth place. Sainz and Vandoorne both take their opportunities to stop. Tweet from @redbullracing: Half race distance and Max is a lone ranger in P5, 21s behind HAM and 16s ahead of PER. A bit of a dodgy Mercedes strategy decision has allowed Vettel to close the gap to Bottas to just 2.5 seconds now. Esteban Ocon pits from inside the top ten, the first of the Force India pair to stop. Lance Stroll follows the pink car into the pit lane for his own stop at Williams. Mercedes blink first and it's Bottas that comes in from the front of the field. Bottas rejoins in fourth position, with Vettel inheriting the lead for now. Pérez comes in, another quick stop from the Force India crew. He rejoins and retains his position ahead of teammate Ocon. Vettel out in front means this is the first time a car other than a Mercedes has led a lap at Sochi. So good to have competition. Team radio from Kimi Räikkönen: "Rear is going, rear is going." Vettel is currently following the backmarker of Stroll, calling for blue flags as the Williams fails to get out of the way. Räikkönen comes into the pit lane with Vettel staying out for another lap in front. A slower stop from Ferrari, 3.1 seconds for Kimi who heads back out in fourth place. As Kimi heads out, Max Verstappen comes into the pit lane for his own stop. Verstappen rejoins just in front of the yellow Renault of Hülkenberg, remaining in fifth place in his solitary race. Hamilton gets the call to pit and the Mercedes crew dash out with fresh tyres for the Brit. So at this point it's just Vettel out front and Hülkenberg in sixth who have not yet stopped. Ferrari give Vettel the message to stay out for another lap. There's a 19 second gap between him and second place Bottas. Vettel gets mixed messages on this lap, "box, box, box," quickly followed by "stay out, stay out." Who knows?? Team radio to Valtteri Bottas: "It's critical you get past Kvyat, as quickly as you can please." The Ferrari mechanics are out in the pit lane and yes, this time Vettel does come in for his one and presumably only stop this afternoon. Replays show there was the smallest of delays on the front left tyre for Vettel, which will have damaged his chances here. Now just Nico Hülkenberg remains to come into the pit lane. He's currently running sixth. Daniel Ricciardo: "We didn’t really expect it, that early in the race as well. I don’t know how much running behind the safety car and having two starts hurt that. It’s a disappointment, just not being able to get many laps in the race. We know this circuit is hard on brakes, we didn’t do massive long runs in practice, from what we did we didn’t expect to have these issues this early in the race… we need to address it, it’s two races in a row, so hopefully we’ll get on top of that." Replays show a big lockup from Bottas and he runs wide just narrowly missing the barriers. Not good for his front tyres with more than ten laps left to go. Vettel is closing the gap to race leader Bottas, with the lock up from the Mercedes not helping his situation. The gap is down to under two seconds now. Nico Hülkenberg finally comes into the pit lane, lap 41. Fresh supersofts on the Renault. He rejoins in ninth place. Tweet from @ForceIndiaF1: The Hulk finally stops - our duo is back in P7 and P8! Felipe Massa has come into the pit lane. That's unexpected. Apparently he had a slow puncture which is disappointing. He rejoins in ninth place, behind Hülkenberg. Team radio from Valtteri Bottas: "The remaining laps, I want less talking." The pressure is building on Bottas, the gap ebbing and flowing between 1 second and 2 seconds. Seven laps to go. The Mercedes and Ferrari are trading fastest sectors. Bottas purple in S1, Vettel purple in S2. Coming up to the back of that fight for seventh are, you guessed it, the race leaders. The gap is down to 1.5 seconds, with traffic ahead. 4 laps to go. Fastest laps from Vettel. Verstappen reports debris in turn five, and there is a piece of carbon fibre sitting on the track - thankfully off the racing line. Out of nowhere, Räikkönen sets the fastest lap of the race so far. 1:36.844. Vettel moves into DRS range, but Bottas is coming up behind Massa, so will get his own DRS advantage there too. Vettel had something of a slide at the final corner, and Bottas has dispatched Massa into the first corner, with Vettel having to take the Williams a couple of corners later. The Ferrari does muscle his way past, but it was scrappy and he lost momentum and probably some grip as well. Team radio from Sebastian Vettel: "What was that??" Valtteri Bottas wins the Russian Grand Prix!! First F1 race victory for Valtteri Bottas, great job by the Finn. Team radio from Valtteri Bottas: "Took quite a while, eh? It was worth the wait." Vettel was second and Räikkönen third, with Hamilton a very distant fourth. Non-existant gap between the first two cars. The free pit stop strategy didn't pay off for Vandoorne or the Sauber drivers, as they took up the final three positions. Vandoorne did get to the end of the race, though, which is a bonus in that McLaren. See also: Stroll. Tweet from @ForceIndiaF1: We go up to 31 points, reinforcing our fourth position in the Championship. Seventh double-points finish in a row! Felipe Massa congratulated Bottas in the pit lane, which is a nice sight, former teammates that they are. In the podium green room, Vettel and Bottas have a good chat, whilst Räikkönen doesn't look too bothered either way. The drivers take to the podium after chatting with the necessary people. Big wave from Kimi to the crowd, Vettel has big smiles and looks happy with second, but all the cheers are reserved for Bottas. Tweet from @alo_oficial: Congrats @ValtteriBottas on your first win in F1! Champagne, much of it aimed in Bottas' direction, as you might imagine. All things considered, it was probably the best Russian Grand Prix that has been held to date. There wasn't a lot of overtaking and there could have been better racing, but it was still a fascinating event which will add enormously to the season's story. It's a crucial weekend for Bottas, not just to get his first win, but to prove that he can more than hold his own against Hamilton. It's not clear if it was a problem on Lewis' car that really stopped him racing today, but Bottas had the measure of him all weekend. As always, much disappointment for the retirements, particularly Fernando Alonso and Daniel Ricciardo. But also for Grosjean and Palmer who needed to get some more points on the board for their teams. It will be interesting to see what the stewards decide about that first lap incident. 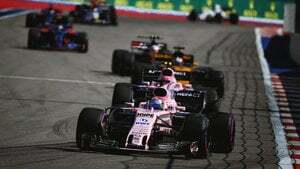 Great weekend for Force India, and for Williams who picked up some points and got Lance to the end of the race. We've got two weeks now before the racing returns in Spain - Barcelona heralding the start of the European leg of the season. It's a race track they know well, but at this point, it's almost impossible to know who will come out on top! The way it should be! That wraps up another FBFB, thanks for joining me, my F1 friends, and see you next time! Previous post The Great Debates - Can you compare F1 eras?